Global food giant Nestle said it has found that its Thailand seafood suppliers are engaged in abusive labor practices -- a risk many companies face when sourcing from the country's fishing industry. Poor migrants seeking work in Thailand, the world's largest shrimp exporter, are being exposed to hazardous, inhumane living, and working conditions. Some are charged excessive fees, leaving them stuck in debt, in order to get jobs where they catch and process fish that ends up in Nestle's (NSRGF) supply chain, according to a report the company commissioned from Verite, a U.S.-based fair labor advocacy group. Nestle is one of the biggest food companies in the world, and owns brands such as Perrier, Purina pet food, Haagen-Dazs and Nescafe. These labor issues, however, "are not unique or limited to the Nestle supply chain," the report said. "Virtually all companies sourcing seafood in the Thai seafood sector are exposed to the same risks." The report found that workers were lured to work under false pretenses and often had their pay withheld and personal identification documents confiscated. Some laborers also said they were subjected to verbal and physical abuse, and were sold to boat captains needing crews for their ships. In August, a federal lawsuit was filed in California against grocery retailer Costco (COST), demanding that it label much of the shrimp it sells as the product of human slavery. The lawsuit also wanted Costco to stop buying shrimp from its Thailand suppliers. Thai shrimp commonly sold in the U.S. comes from farms, and the feed for the shrimp is often sourced from slave-staffed fishing boats known as "ghost ships," according to the suit. Workers on those boats are kept in cages to prevent them from escaping, the suit claimed. Just one week after the Costco suit was filed, a class action suit was filed against Nestle alleging the company's Fancy Feast cat food -- imported from its partner, Thai Union Frozen Products -- was the product of slave labor. 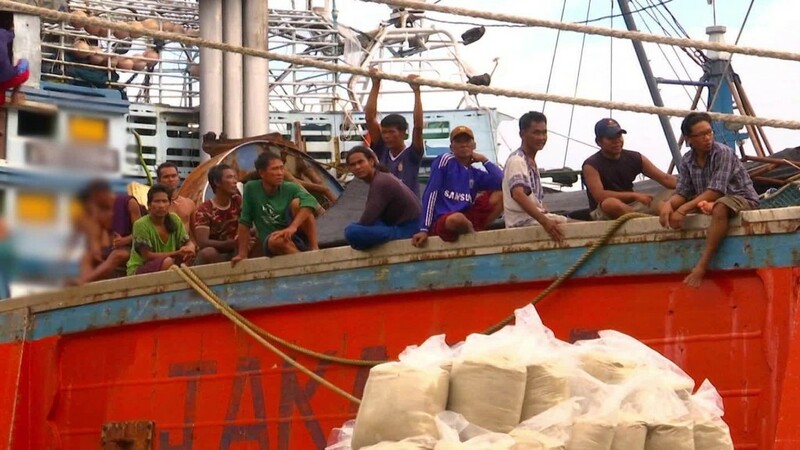 The workers are often trafficked from poorer neighboring countries in Southeast Asia, according to the complaint. Nestle said Monday it would work to improve the situation by finding a way to track the source of seafood ingredients, training boat captains on proper practices, and conducting audits. The company has also promised public updates periodically. "Nestle is committed to eliminating forced labor in our seafood supply chain in Thailand, working alongside other stakeholders to tackle this serious and complex issue," said Nestle's Magdi Batato, executive vice president of operations, in a statement.